A round-up of all improvements and changes to the Buzz platform in version 2.0.54 & 2.0.55, available on June 30, 2016. As we develop new features, we allow you to enable some of them before they become standard, so you can test them and release them on your own schedule. New Admin app (released 2016-02-11): A complete overhaul of the Admin experience. New Activity Grader (released 2016-03-17): Minor enhancements to improve workflow. Multi-outcome scoring (2016-06-02): An addition to Buzz's Gradebook that allows teachers to track and assess student performance across multiple desired outcomes. While originally released as part of the new Editor tool beta, all users can now take advantage of this powerful tool. Peer Assessment (2016-06-02): A new activity that allows teachers to have students assess their classmates' performance using a teacher-provided rubric. While originally released as part of the new Editor tool beta, all users can start assigning his interactive activity. How do I create a Peer Assessment? If you have any questions or concerns, please contact Agilix support, engage our Help Center, or contact your Agilix account manager. Course Cards for all courses now appear on the Teacher's Home (previously, Master courses and non-current courses were not displayed). As part of this changes, teachers can now choose which Course Cards to show and which to hide. As a result of this change, current teachers are likely to see some Course Cards appear on their Home pages that hadn't appeared before. See instructions: Hide Course Cards (NEW). 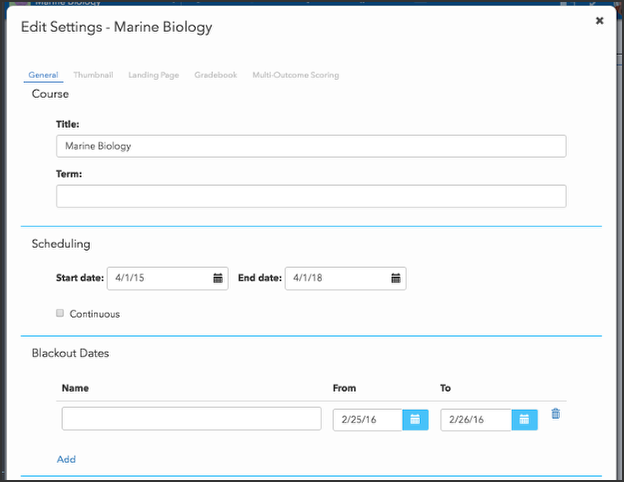 Teachers can now define course blackout dates using the Editor tool. In April of this year, we revamped how badges are created and managed by in the Admin app. As previously announced, while these updates make badge use easier and more powerful, the change requires some action on your part. In this release, we removed a Badges section from Domain Settings that was titled Badges (soon to be deprecated). Review these instructions to find out how this may impact you. Admins now have a new tab called Observers in the Users tool when looking at a specific user's data. The Observers tab displays all observers for the selected user. The Badges (soon to be deprecated) section of Domain Settings > Course Options has been removed and all badges are now managed in the Badges section. This change was previously announced, and you can learn more here. Revised the Submit button in the Activity Grader; it now reads Submit All Scores and, when used, it submits both the edits made with the current Grading session as well as any edits made and saved in previous sessions (previously saved edits have a pushpin icon in the Status column). If you're not using the Grading tool, you can always submit saved scored with Return in the toolbar. Observers are now listed under the student name for teachers when they're looking at a specific student's data in the Performance tool. Revised the behavior of the Automatically assign zeros to past-due activities option in the Gradebook tab of Course Settings. Previously, an activity wouldn't be marked as zero until the due date and any grace period dates have passed; now, the activity is marked as zero once the due date passes and is revised if students submit during the grace period. NOTE: Because this functionality is not supported in BrainHoney, you will need to reselect this setting when migrating courses from BrainHoney to Buzz. Added bulk edit functionality to the Activity List in the Editor tool. Added padding to the bottom of the Editor screens to accommodate dropdown menus. Updated Main Menu items to stop items that can't be opened in a new window from attempting to. Fixed an issue where users would get an error when trying to create a new course using a course template because only the last template added was being flagged as public. Now all templates added are flagged as public. [Firefox] Fixed an issue where video recording would not function in Firefox. [Firefox] Fixed an issue where some buttons that were supposed to display horizontally were being displayed vertically. Added help text around passwords to inform teachers that, when provided with base-64 encoded string password, the password is encrypted and they should not use provide it to their students as the password. Fixed an issue where the code (x) for locking answer options in place when using the assessment/homework question text editor wouldn't work. Removed a note from the Clipboard about task folders that is no longer necessary. Fixed an issue where clicking select all in a filtered table would disregard the filters and select everything. Fixed an issue where shared courses would sometimes not appear as courses to copy. Fixed an issue where excused activities would not display for parents in the Activities tool. Fixed an issue where folder thumbnails would not update when changed until the user refreshed the browser. Removed unnecessary space created for a task folder in the Syllabus. Fixed some issues where task folders would behave strangely (appearing when unnecessary, disappearing suddenly, etc). Fixed an issue where users were allowed to move parent folders into their own children folders. Fixed an issue where users were not allowed to move parent folders into empty folders. Fixed an issue where, when adding a new activity to a course, users could select a grade scale and save the settings but the change wouldn't actually save. Fixed an issue where some flags weren't being properly set for new homework activities created in the Editor. Fixed an issue where dragging and dropping objectives and badges to activities wasn't working appropriately. Fixed some issues where choice folders would sometimes disappear when edits were made to them. Fixed some issues where choice folders would sometimes appear in the wrong sequence. Fixed an issue where project items and properties would sometimes not appear in the Projects tab. Fixed an issue where items with x (delete) buttons, like objectives and badges, would wrap incorrectly in the Activity List tab.